The phrase, "Everything is bigger in Texas" certainly exemplifies Houston. It is the largest city in the state and the fourth largest in the nation. Located in the eastern portion of Texas, it has the eighth largest port in the country and is connected by ship channel to Galveston Bay and the Gulf of Mexico. Unconventionally, it is also the largest "unzoned" city in the nation, creating an interesting mix of residential and commercial properties. The city of Houston originated from a maritime trading post established in 1823 by John Harris. After his death in 1829, his brothers Augustus and John Allen purchased another plot up the Buffalo Bayou and named that trading post after General Sam Houston who had defeated the Mexicans at San Jacinto. The Buffalo Bayou was then converted to a ship channel which led to rapid industrial growth and export of cotton, timber, and cattle. Oil was discovered in 1901 and petrochemical and refining industries took up residence in the area. Decline of oil prices in the 1980s crippled Houston's economy, but medical research, international banking, high-tech manufacturing, and the aerospace industry helped speed recovery. Harris County Government - official Harris County website. Houston City Government - official City of Houston website. 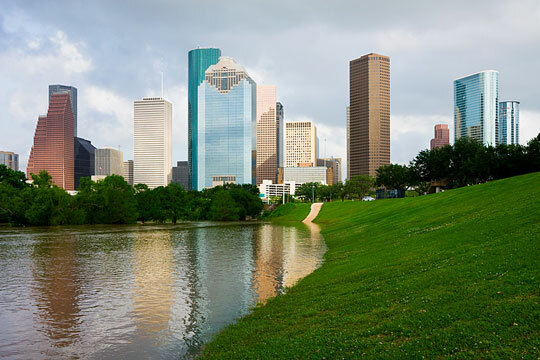 Houston Weather and News - current weather in, and recent news about, Houston. Houston Product and Service Guide - Houston enterprises. In-depth Houston information and news can be found on these regional Houston Libraries and Houston Newspapers pages, respectively. Visitors to Houston will find this Houston Convention and Visitors Bureau website useful.